Detyens are doomed to die at the age of thirty if they don't find their fated mates in time. 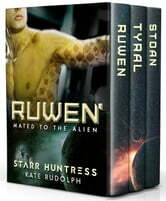 This bundle brings together the first three books in the Mated to the Alien series. Read as Ruwen, Tyral, and Stoan find human mates and a new hope for their dying race. This series will bring you fated mates, steamy alphas, and plenty of space adventures. Captured by pirates with only a week to live, Tyral NaRaxos is on the verge of losing all hope. With no denya, he is doomed to die on his next birthday, if his captors don't finish the job first. Someone is after Dorsey Kwan and she doesn’t know why. Captured by pirates, she’s wasting away, dreading death or slavery. A chance escape with a fellow prisoner gives them both a chance, but nowhere is safe with a bounty on her head. From the moment he sees her, Ty knows Dorsey is his mate. But even if they can defeat the pirates, there are worse enemies after both of them. A man living on borrowed time doesn't care about making enemies, but given the chance he will fight with everything he has to ensure his mate's survival... and his own. Unless he finds his mate, Stoan will die when he turns thirty, which makes him willing to take the most dangerous jobs. When he spots the human woman who awakens the denya bond within him, he knows they can never be. Reina Draven almost lost everything at the hands of a warlord’s ambition. As she’s pulled into a world of danger and intrigue, her only stable force is the closed off blue alien assigned to be her partner on a mission she's been drafted into undertaking. Though the flame of desire sparks hot between them, she doesn’t know if she’s ready for romance, and he seems determined to keep away from her. Their mission takes them deep into enemy territory, and Reina and Stoan need to learn to trust one another or face fatal consequences. As the danger heats up, so does the spark of their bond. But when a surprise from Stoan’s past throws a wrench in the works, their future is threatened by something even more dangerous than a brutal general's attention. Will Stoan choose to step into the future with his denya? Or will his secrets swallow him whole? This is a wonderful set of 3 human/alien books, each alien is looking for their destined mate who they need, or they die. Each book is a different story about a different couple and so there are easy places to stop reading and take a break if you need to. There is lots of action, distrust, relationship building and romance. I enjoyed all 3 of the books, I can’t really pick a favourite as they are all so wonderful in their own way. This is a fun and exciting set to read, each book has a HEA. If you enjoy this genre then you are sure to fall in love with these aliens and their destined mates. I received a free copy of this book via Booksprout and am voluntarily leaving a review. This set brings together the first three books in the Mated to the Alien series a well written group of books that once I started reading I was not putting down. The books in the series are #1 Ruwen which is Ruwen NaNaran and human Lis Jaynx she has been kidnapped an dropped off on the planet Polai. When Ru sees Lis he knows she is his denya but can he get her to trust him? #2 Tyral which is Tyral NaRaxos and Dorsey Kwan who has been captured by pirates but then they escape together. Ty knows Dorsey is his mate, can they fight the evil after them and win? #3 Stoan which is Stoan and human Reina Draven who awakens the denya bond within him but he does not want it with his enemies close. Will they get their happy ending? Read this set and find out. I recommend. I received a free copy of this book via Booksprout and am voluntarily leaving a review.